Hello again! Lately, I have been scrapping in the 8"x8" journal and I really loving it! The size is practical for a mama like me who wants to craft in a shorter time frame aka less space to fill. Haha. As always before I begin, I will get ready my photo and supplies ahead. That would sure speed up the process too. Working within the collection sure help too! The inspiration really came from both our attires. And with that in mind, I decided to go with the monochromatic theme - black & white with a hint of gold. 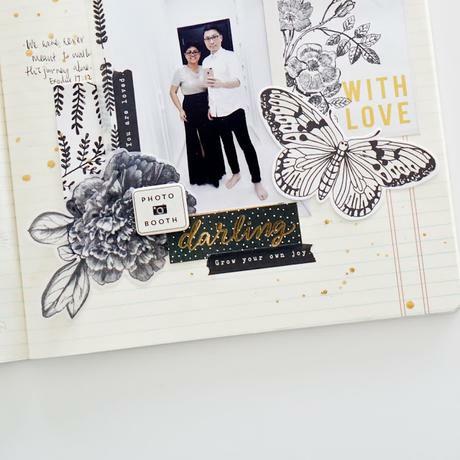 I really love what I found and begun to layer the embellishments all around the photo. It's pretty simple to assemble this page. 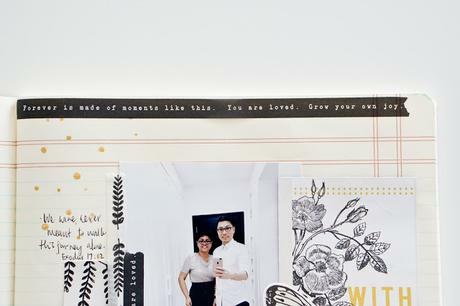 I adhered the photo in the middle and I slowly worked my way around the photo by layering papers and embellishments together. Usually I do not really have any plan for placement but I just go with the flow by allowing the products to lead me instead. 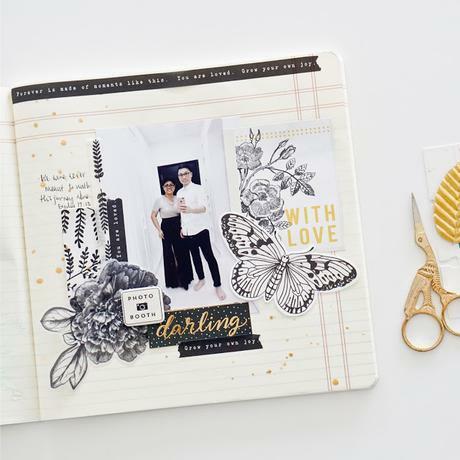 Just by using different kind of stickers, ie: cardstock and chipboard will give different textures and depths to your page. And also splattering some gold mist would give the arty look too! I absolutely love the washi tapes! Those words are just perfect for my page! 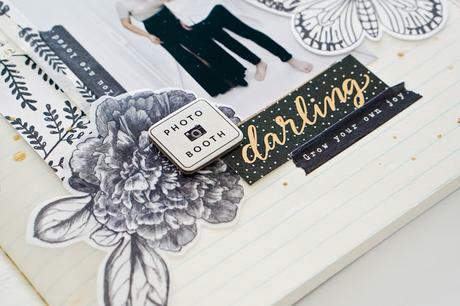 Supplies : Maggie Holmes Flourish - 12x12 Paper Pad, Ephemera Die-Cuts, Washi Tape, Cardstock Stickers, Chipboard Stickers.